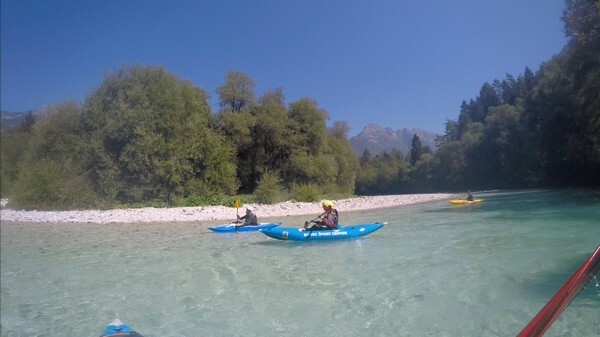 Kayaking on the clear blue Soča River in Slovenia is like a dream come true. The presence of clear blue water between high peaks creates a magical setting. 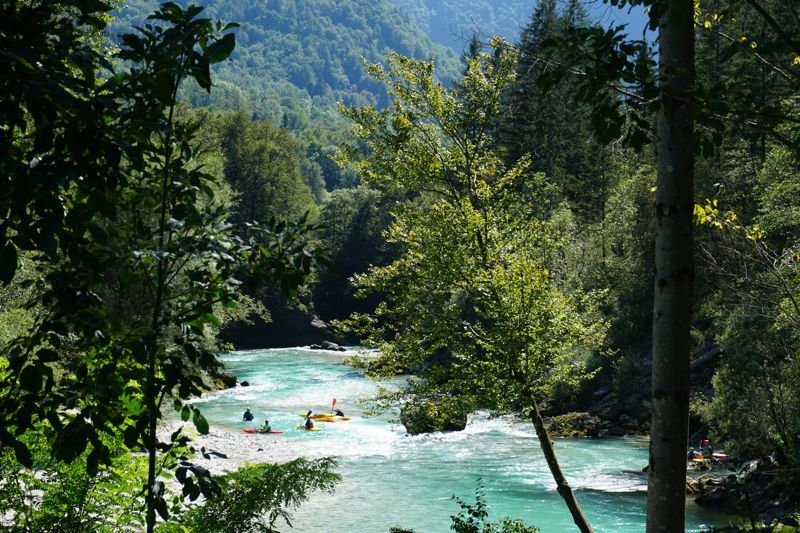 The sometimes quiet and sometimes dangerous rapids make the river a challenge for kayakers of all levels. 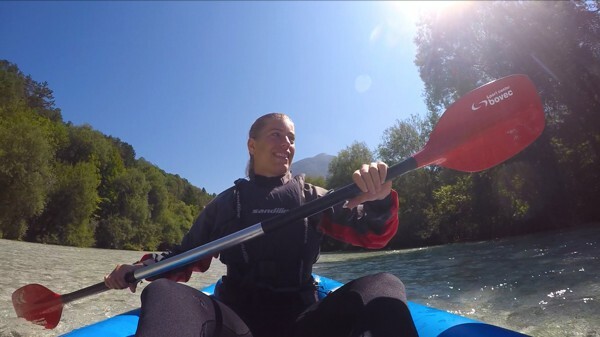 It’s 10 o’clock and we are at Bovec Sport Center, getting ready for our third activity on the Soča river: Kayaking. We are together with a guide and three Slovenians: Martin, Marco and David. Because we are still beginners, we are doing level I / II today. 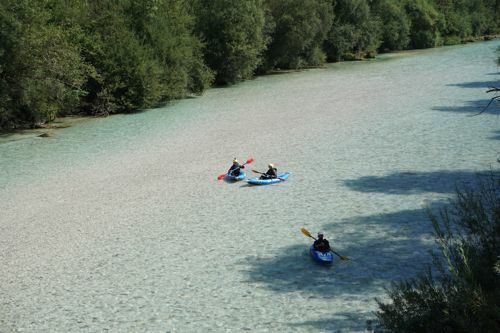 For a couple of days now, we have seen kayakers paddling along the Soča river past our campsite. Now it’s finally time for us to experience this thrill. We take the boats off the trailer and we put them in the water. 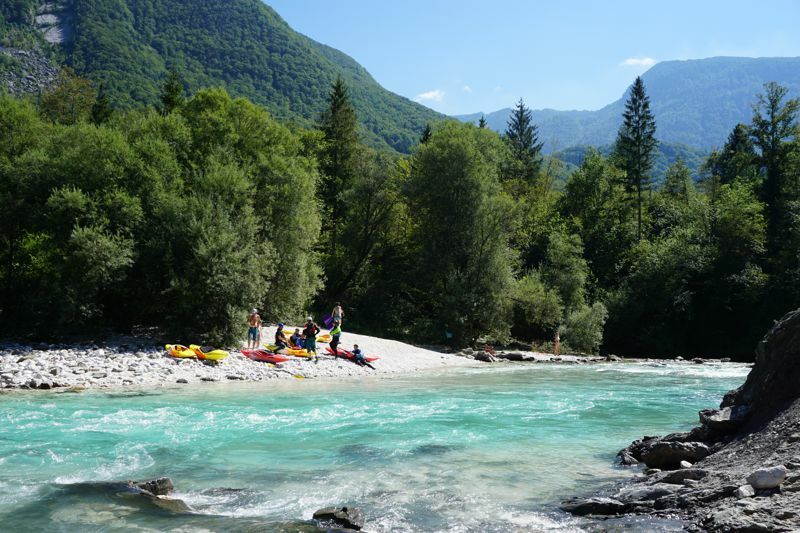 “The beginning of the Soča is not too exciting,” says the guide, “but after the turn, there will be a big stone.” We need to be very careful, because it’s a place where people have drowned. Luckily we are naturally talented kayakers, so we pass the stone unscathed. Seemingly effortless, we glide into waterfalls. 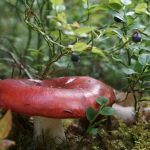 With every acceleration we have to sit up a little, but on the quiet parts we can lean back, let the river carry us and we have time to enjoy the view. Halfway, we pass our campsite and we can see our tent within walking distance of the river. After that, there is a small area where we can practice our kayak skills. The guide tells us to paddle against the stream and to try to get to the other side. As long as we keep the tip of the kayak in the right direction, it is surprisingly easy. If you keep the tip of the kayak in the stream, it will be surprisingly simple! If you then put the paddle in the water, the current will push you back down the river. 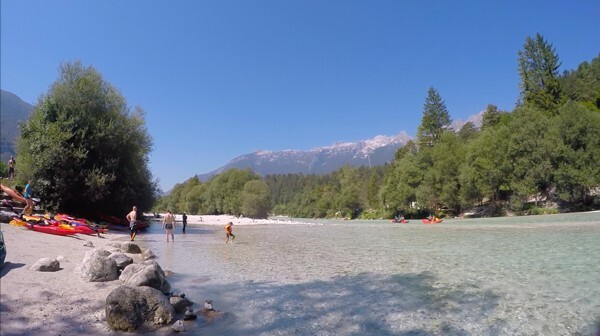 Further on we play Frisbee on a beach in the middle of the Soča river. It is a pastime because the area where we can kayak now is quite short due to a lack of rain. We would have liked to paddle more, but so be it. 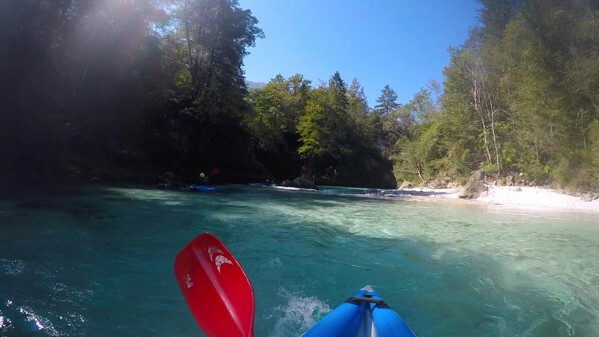 We kayak the last part to the Prijon Sport Center, where people can spend the whole summer taking kayak lessons. We lift the kayaks out of the water and we are free to relax and freshen up at the campsite. 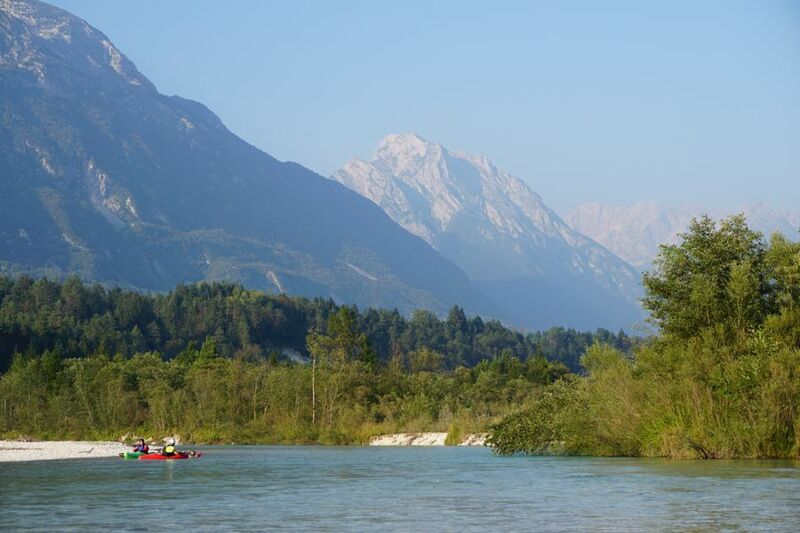 After that we go home and build our fire on an island in the middle of Slovenia’s Soča river. Life is good!